It looks like something out of a James Bond film. But the presidential seal on the side marks this hulking limo out as something not even the superspy will be able to get his hands on. 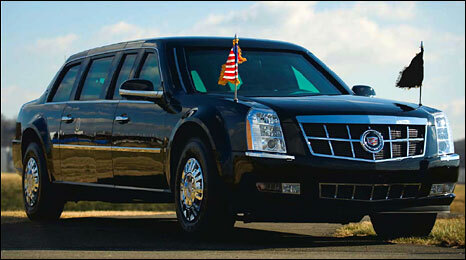 These are the first pictures of the new armoured limousine which will be used to ferry Barack Obama around. Nicknamed "The Beast", the Cadillac will make its debut on 20 January, as part of the inaugural parade. It is traditional to show presidential cars off for the first time in this way. The Secret Service said the 2009 limo would provide it with a "valuable asset" in providing its occupant with the highest level of protection. "Although many of the vehicle's security enhancements cannot be discussed, it is safe to say that this car's security and coded communications systems make it the most technologically advanced protection vehicle in the world." Observers say the car is likely to include bullet proof glass, an armoured body, a separate oxygen supply, and a completely sealed interior to protect against a chemical attack. Some joke the car is so tough it could withstand a rocket-propelled grenade. Its tyres are said to work flat, so the vehicle will keep going even if shot at. While the car's interior is a closely guarded secret, there is no doubt "The Beast" has been kitted out with the best and most up-to-date equipment. David Caldwell, a spokesman for General Motors which makes Cadillac, told the BBC that the car is made to specifications that the company is given by the federal government. "One of the specifications is that we don't talk about the specifications," he said. But Mr Caldwell did reveal that the car has been made in keeping with the design of a contemporary Cadillac, and would include a hand-crafted interior. When asked if it included such extras as an iPod dock, he said he could not comment specifically, but added that the limo would have "state of the art electronics".